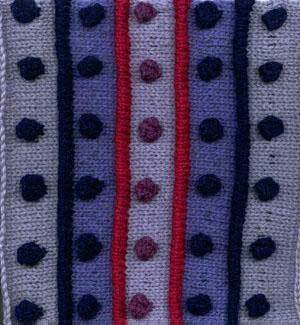 I used approx 50gm of oddments of 8 ply 100% Wool in various shades of pink, purple and blue. slip 1, K2tog, pass slipped st over. Work 5 rows st st beginning with a purl row. Using a spare needle, pick up all the loops on the back of your knitting that were formed by the first row of piping colour. Knit one picked up stitch together with one st on your needle across the row. You should finish with 47 sts. This forms the piping. *** Work from * to *** four times and from * to ** once.